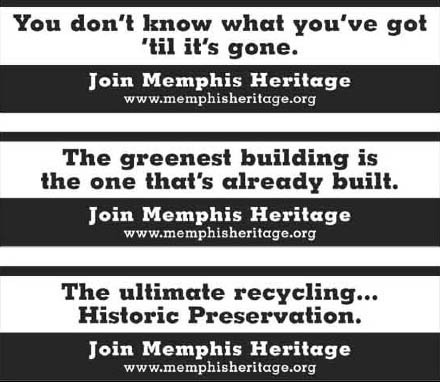 Memphis Heritage has 3 new bumper stickers, each for sale for $3. They're a chance to show that you support saving, preserving, and reusing architecturally and historically significant buildings, streets, neighborhoods, parks, and cultural artifacts of Memphis and Shelby County. The riverfront's Public Promenade and Cobblestone Landing are two of our city's most important historical places. Preserving our landmarks not only helps us environmentally, but it can also save money. And probably most importantly preservation provides Memphians with a sense of pride and identity. 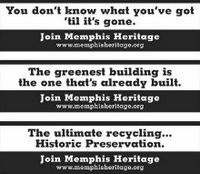 Click HERE to learn more about Memphis Heritage and to order your bumper sticker.